Coming to Portsmouth next week? The Louis Vuitton America’s Cup World Series in Portsmouth kicks off this time next week with two days of racing (yes a ‘blink and you miss it’ type of regatta), over the weekend of 23-24th July with practice racing taking place on the preceding Friday, the 22nd. Last year torrential rain on the Friday and gale force winds on the Sunday, sandwiched one of the greatest day’s racing ever seen on the Solent as the foiling AC45s locked horns off the Southsea esplanade. While statistically you would hope the weather should be much improved this year, ruling over the factors that can be controlled is Event Director Leslie Greenhalgh. Studies were done and lessons learned from last year’s event and these have been implemented by the organisers, Sir Keith Mills’ company Team Origin Events, for this year. However from the feedback they got back following that event, it turns out that there were a lot more sailing fans or fans-in-the-making than they had previously dared hope. Unusually given that it is a ‘series’, organisation of the America’s Cup World Series events are left – outside of fundamentals such as broadcast times and race format – to the individual event organisers. However Leslie Greenhalgh points out that this does allow events to be tailored each countries culture. And the individual events have been working together. “Otherwise you are reinventing the wheel. So we did quite a lot of work with Oman and Chicago which both had quite a similar feeling and capacity to us." Typically this year the LV ACWS events have been taking place over three days and thanks to lack of wind in some venues, notably New York, the Friday has started to become valuable. Previously the Friday was a ‘practice day’ with a mix of fleet and match racing. Now the format has evolved so that the racing on this day comprises three fleet races which can be used as ‘substitute races’ which may counts (as they were in New York). In addition this time, the AC45s will be moored directly off the Race Village and there will be much more made of the ‘dock out’. It is possible to see the racing on your own boat, however because of the tightness of the race track and its close proximity to Portsmouth Harbour this has to be managed. Anyone contemplating this should email TeamOrigin here (watchonwater@teamorigin.com) for more info. Those interested will be sent a course layout clearly indicating the two areas from where those on spectator boats can view the racing including an official Notice to Mariners relating to the event further indicating where to go and not go. While watching the racing on the water viewers can also listen to hear radio commentary (including from our esteemed collague Andy Rice). As a side option, those who want to watch on the water but don’t have their own boat can contact Sunsail or Solent RIB charters. Both companies are partners of the America’s Cup World Series Portsmouth and their clients get to view the racing from their own spectator area. To get more from the event, access to the Race Village costs £25 and are available online from Ticketmaster. In the Race Village visitors will be able to take in a live show taking place on the main stage there from 1100-1800 daily. This will include the dock-out show where all the crews will gather on stage before heading out to sea on their boats. For the ‘best seats in the house full-on VIP hospitality is available at £595/ticket. 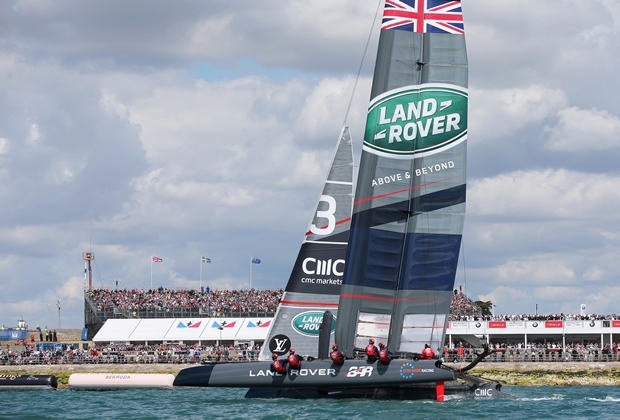 For British fans the Louis Vuitton America’s Cup World Series Portsmouth will also be one of the last occasions to see Land Rover BAR sailors in action publicly in the UK, before they head off to Bermuda to base themselves permanently in the America’s Cup venue next year. There is no America’s Cup World Series Portsmouth event taking place in 2017.